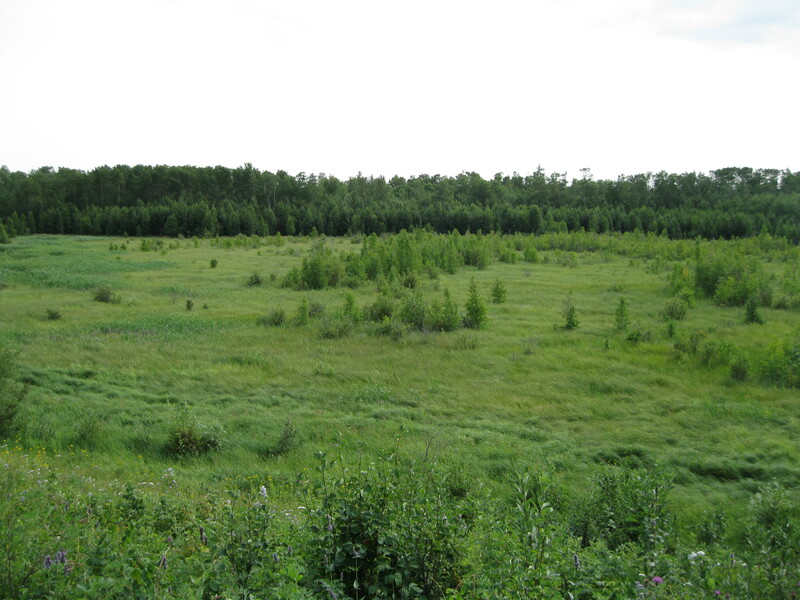 The park is located 35 km (21.9 miles) to the east of Edmonton in Alberta and was established in 1913. If you are in the capital of this beautiful province or in the area, you should definitely do your best to make time to head down to Elk Island National Park as it is a bit of a hidden gem. The park is situated in the Beaver Hills area and has provided shelter for wintering herds of elk, bison and moose for centuries due the presence of aspen and vast water resources. There has never been any permanent settlements by the First Nations People but there are evidence of the presence of Blackfoot, Sarcee and Cree Indians with more than 200 archaeological remains of campsites and tool making sites. The area was an important camping place for nomads migrating between the plains and the hills. 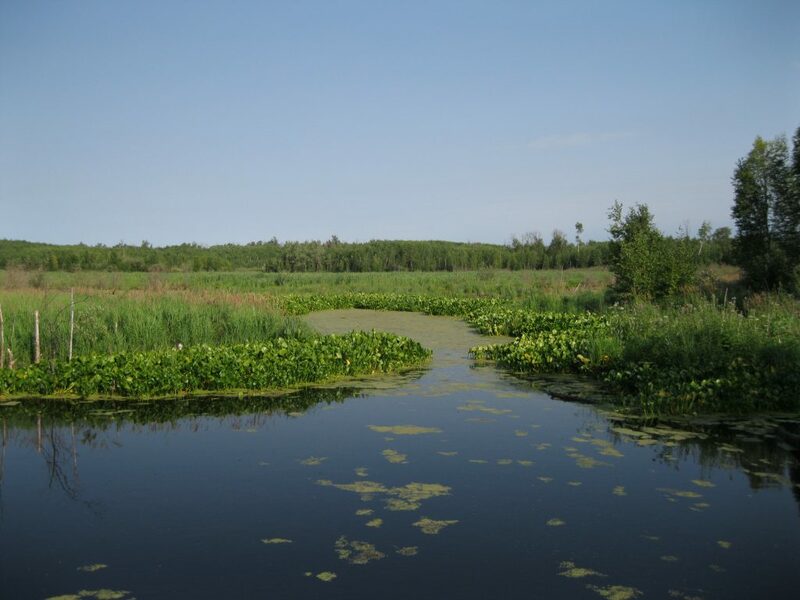 The Cree called the region “Amiskwaciy” which means beaver hills. They combined the traditional life based around hunting and fishing with trapping and trading with the Canadian fur companies. The Cree hunted bison based on skills they had picked up from Indians to the south. 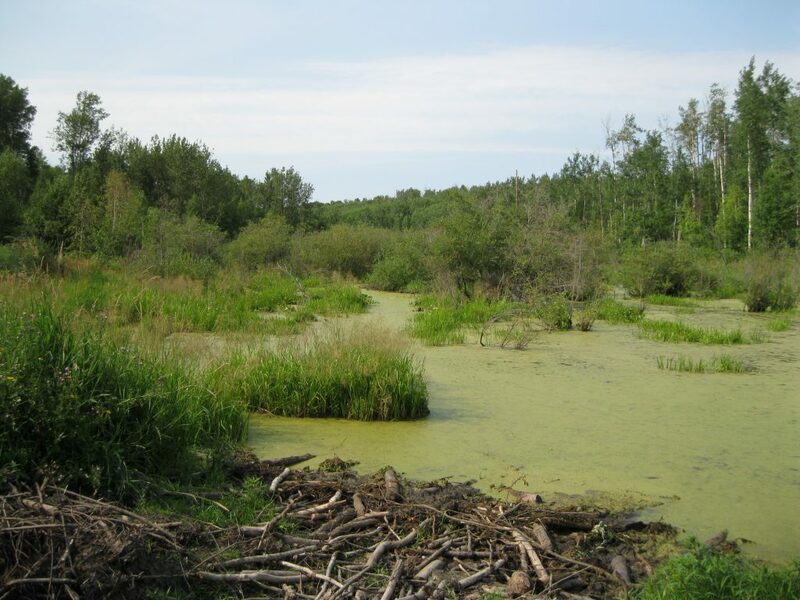 It was a desired area for hunting which supplied the fur trade and by the 1830s the beaver became extinct in the region and abandoned the area as a permanent home but would still travel through. The bison population was pretty big until 1841 but by the late 1860 they were nearly wiped out. Most of the area was untouched from the 1870s through the homestead period. The forest was viewed as valuable timber by some and a hindrance to settlement by others. In 1895 a fire hit the region hard which prompted the federal government to protect the forest in 1899 which became known at the Cooking Lake Forest Reserve. Even though the forest was protected, the wildlife wasn’t and the settlers posed a threat to population of animals, especially the Elk which were considered one of the last herds in the Canada. In the 20th century human settlement had nearly eliminated the presence of elk in the area. Ellsworth Simmons was among a group of five people from Fort Saskatchewan who lobbied the government for the establishment of Elk Park and in 1906 they convinced the federal government to create a wildlife sanctuary for the elk of Beaver Hills. The same year, Elk Park was established with e 2.2 metre (7.2 ft) tall fence marking the boundaries. It is the only national park in Canada that is completely fenced in. 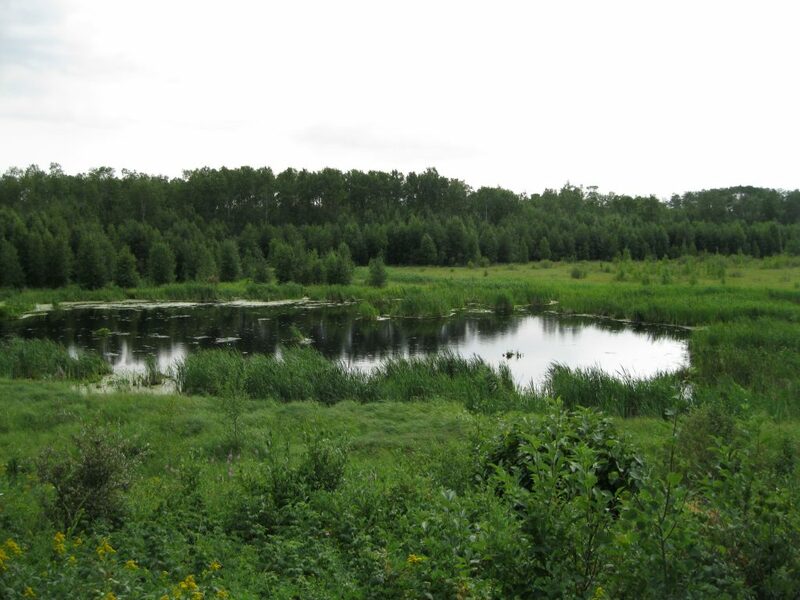 This provides the perfect opportunities to maintain and enhance the ecological integrity and biodiversity. It Canada’s first large mammal sanctuary and marked a new era in conservation in Canada. 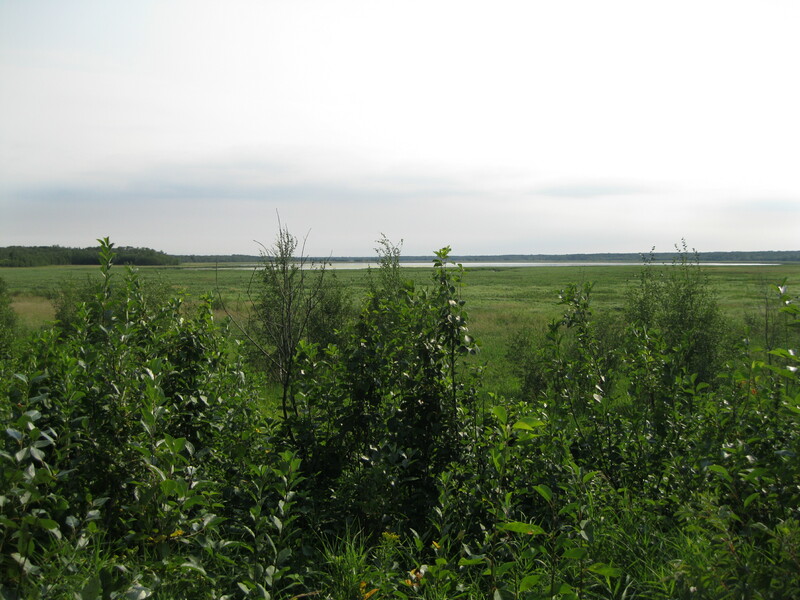 The park was renamed Elk Island Park in 1908. 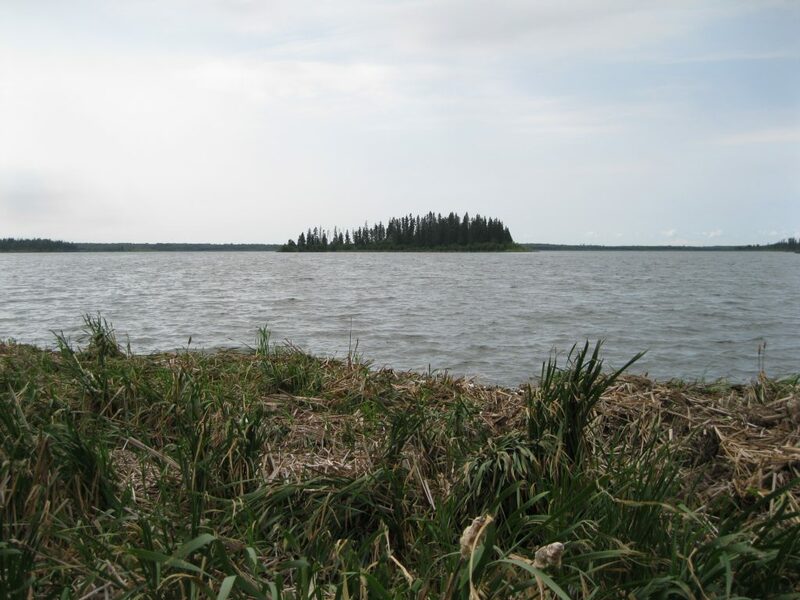 The significance of the name derived from Island Lake, now known as Astotin Lake, and Elk Island which is one of the islands in this lake. By 1913 the park was designated as a dominion park, as it was known at the time, and in 1930 it was officially passed as a national park by the federal parliament. At one point there were 25 million bison spread out across North America but by 1880 it had nearly gone extinct with fewer than 600 individuals remaining. Most of these were collected onto to different private ranches and the last free roaming herd at the time was a population of 30 at what is now known as Yellowstone National Park. Currently more than 500,000 bison are spread over both Canada and the United States, most of these on private ranches. 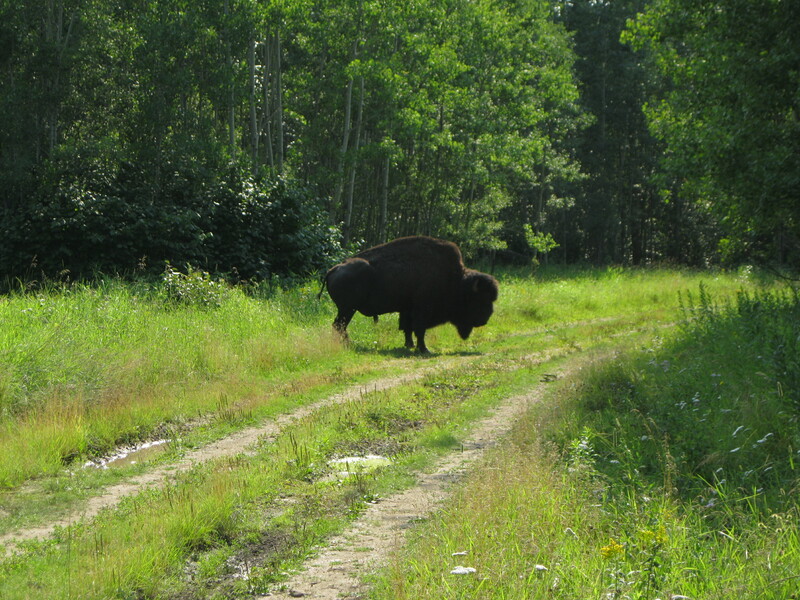 Elk Island National Park has a long history of the conservation of the bison and has played a pivotal role in this respect. In 1907 the Canadian government brought one of the last and largest remaining pure-bred plains bison herd from Montana up to the park. This was about 400 bison shipped here temporarily until the fencing of the then future Buffalo National Park was finished. 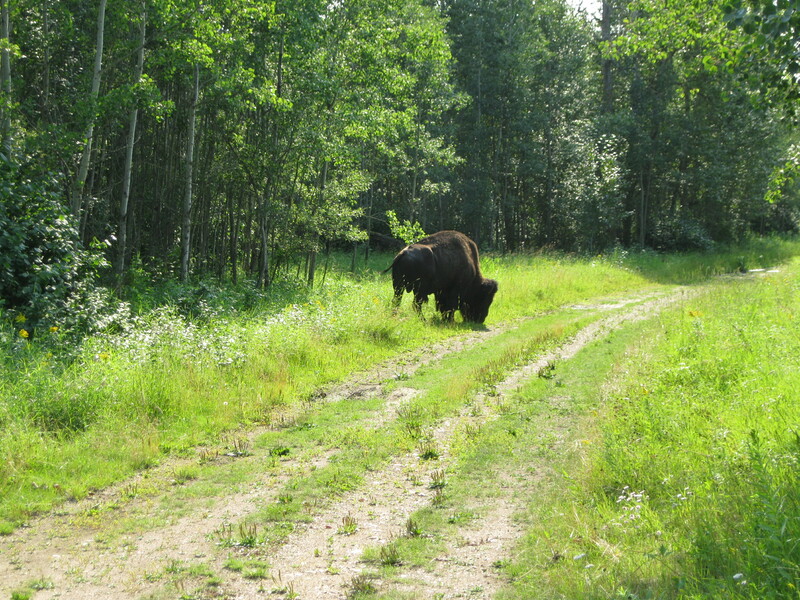 In 1909 upon the establishment of this park, 325 bison were relocated, but around 40-70 stayed in Elk Island National Park and the current bison are the ancestors of this herd. Parks Canada maintains a herd of around 450 in Elk Island National Park and when the number is above this amount they are sold. The park is known for exporting its bison and other ungulates to other conversation areas in North America and even in Russia. In 1969, plains bison from Elk Island National Park were released in the Prince Albert National Park in Saskatchewan at a population of 300 were they can wander around as they please. 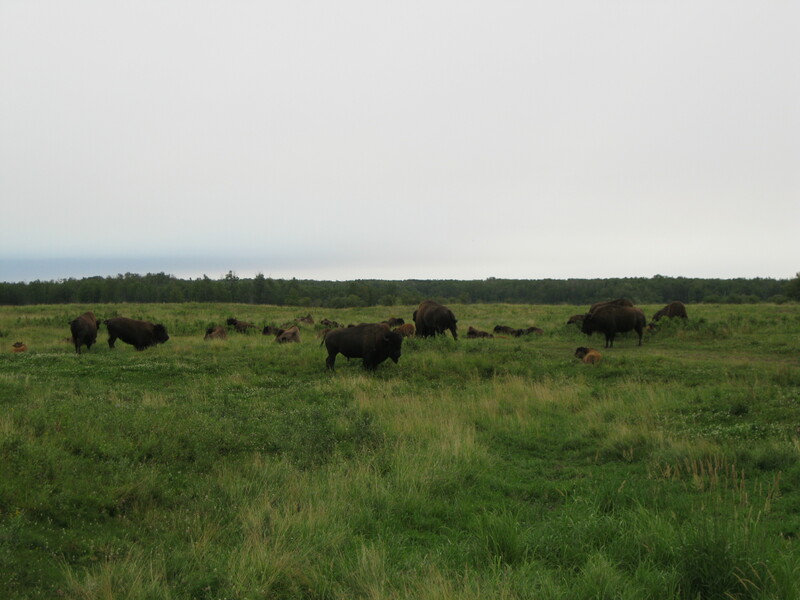 In 2006, more plains bison from the park were released into Grasslands National Park, also in Saskatchewan, which marked the first time bison roamed the shortgrass prairies of Canada since their near-extinction at the turn of the 20th century. If you encounter bison upon your visit keep a safe distance and give them space. Let the bison have the right way in all cases even if you must leave the trail. It’s recommended to make a bit of noise on your path and travel with a mate, as the bison will hear you coming and won’t be startled. Some people may refer to the bison as a buffalo but this is an incorrect term. The buffalo is a different animal found in Africa, South Asia and even in northern Australia where is was introduced. 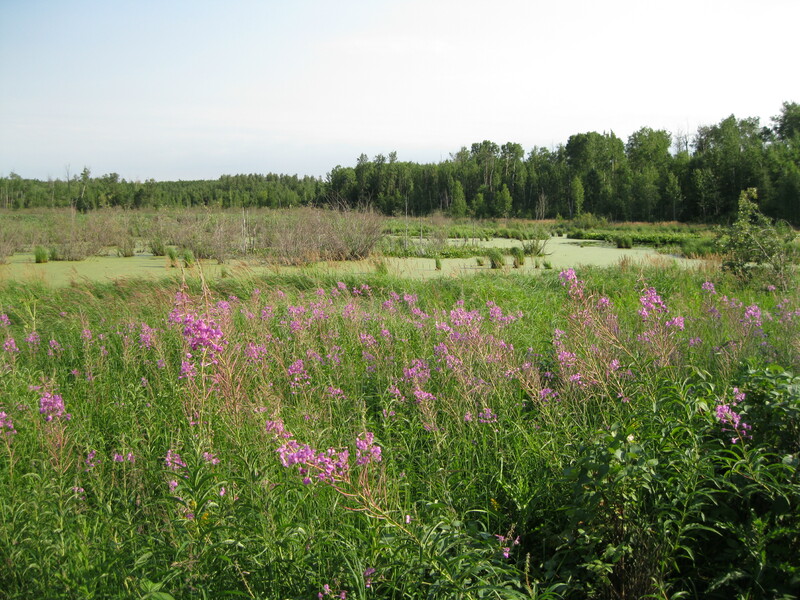 If you are staying in Edmonton for several days, Elk Island National Park will be the perfect place to retreat to for a day or half a day to see what amazing land and nature lies just beyond this wonderful city. It will be a great opportunity to explore something different to the city and also to experience how lucky the people of this city are to have much a glorious park right in their backyard which they can visit at their own leisure. The Yellowhead Highway leads through the park which also meanders through Edmonton so the park is easily accessible from here. Head onto the highway from where ever you are staying in town and continue eastbound for the park which is pretty much on a straight line from when leaving Edmonton until just after the park boundary. Drive down until you hit the first road leading to the left which is Range Road. This road leads into the heart of the park from where a lot of beautiful spots and hiking trails can be accessed. A really cool Elk Island National Park sign is based right at the entrance to Range Road which is very picture worthy, so having a picture stop here is recommended. At the first turn to the right on Range Road, the Visitor Centre is located where some interesting information about the park can be found. It would be a good to check it out as the park staff can also assist you will any question with regard to the sights in the park. It’s a great first stop on your excursion into the park to get some information on what to see and to look out for during your visit. The staff have good knowledge about the history, plant life and wildlife of the park which is always interesting. Continue further down Range Road and make the first turn to the right, which is not too far from the Visitor Centre. This road is known as the Bison Loop Road which is one of the highlights of the park. There are no guarantees, but it is very likely that you will spot a herd of bison along this loop. If you spot them, get out of the car and have a look and take some shots of this magnificent animal. It is so cool to experience the bison up close. Remember to give them some space, not only out of respect for them but also for your own safety as they can charge if they feel threatened. As this is short loop to be explored in a vehicle and you will probably only spend about 10-20 minutes exploring this part of the park. Driving through the loop without stopping takes less than five minutes. If you spot a herd of bison you can spend about 10-15 minutes checking them out and taking photos. Complete the loop and head back on Range Road. There are several options from here and one of them could be to drive to Astotin Lake. Drive all the way down Range Road until arriving at a T-junction, head to the right past the Elk Island Golf Course and you will get to the Astotin Lake Area and Sandy Beach. Turn down here a park your car. This is a perfect spot for a picnic and several facilities such as benches, toilets, a promenade, a boardwalk and a pavilion. There are several cool details as well such as a bicycle rack with a carved bison at each end. Head down to the shore, check out this beautiful lake and enjoy the cool breeze. This is known as Sandy Beach where you can get some awesome shots of the reeds at the shore against islands out in the lake. You may be lucky a see some wildlife such as pelicans. Have a bit of a stroll around the area, enjoy the beauty and take some photos. After you have explored the beautiful surroundings of Astotin Lake head back onto Range Road and drive back south in the direction of Tawayik Lake, but make a right turn towards the area of Oster Lake and Shirley Lake which are located just before Tawayik Lake going in this direction. 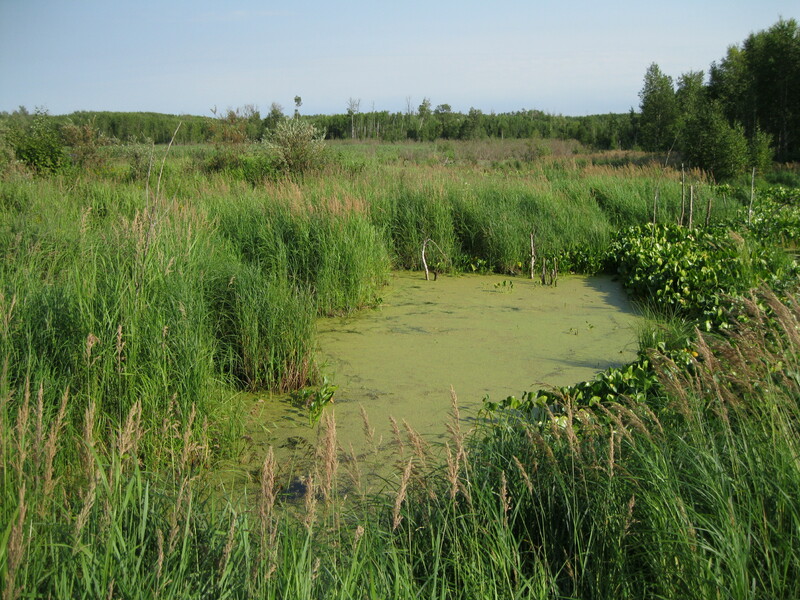 This is a great place for checking out plant life and for spotting wildlife. Head onto the Simmons and Shirley Trails which are two separate tracks that start from the same path. They are numbered 2 and 3 which you will noticed being sign posted when strolling down the trail. The trail is very well marked, wide and on a level surface so the hike can be done in a pair in sneakers. Continue on the Simmons Trail, which is number 2, as this leads down to the magnificent Tawayik Lake. This is a 3.5 km (2.19 miles) long trail. You will be passing an unnamed lakes along the way. 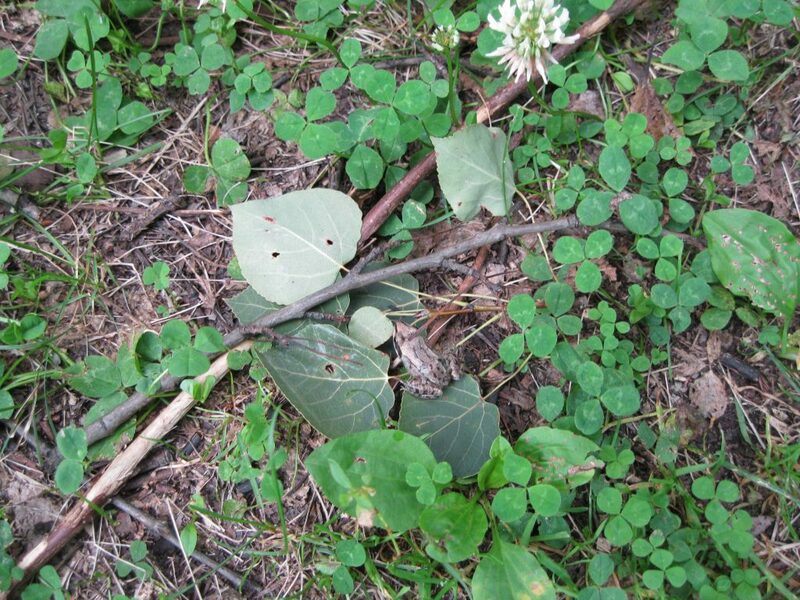 When walking down the track keep your eye out for frogs in the grass and in the bushes. This may very well depend on the season, but during the late summer you may just spot several of this little wonderful creature. It is such a magnificent walk through bushes with terrain suddenly opening up where you will be exposed to a beautiful lake. Bear in mind that it can be pretty humid and hot, quite the contrary to what a lot of people would expect of central Alberta in the summer. Even though the walk is easy and straight forward do not underestimate the need for consuming plenty of water to remain hydrated. During the summer period the wonderful grasslands will be filled with beautiful flowers providing you will a colourful scenery. As the first part of Simmons Trail ends, it leads into a gravel road with a sign pointing towards Tawayik Lake. Head down to the right on the gravel road on what is a short stretch of the Shirley Lake Trail, number 3, which leads straight to Tawayik Lake 100 metres (328 ft) down the road. There is a very nice picnic area at Tawayik Lake and this is also where track number 9, known as the Tawayik Lake Trail, starts. The whole trail is 16.5 km (10.3 miles) long but you can just decide to do a bit of it and head back. It depends on how much time you have. Doing the whole trail could take you about 4-5 hours. After just a short walk on the trail you will get to a viewpoint of the lake. It’s a vista of grassland pretty much as far as the eye can see but this is all a part of the lake. The water levels varies for time to time. On display at the viewpoint are all the water birds you may be lucky to spot around the lake. You have to be patient, listen for the sounds and look out beyond the cattails and you may just spot for wildlife such as the common goldeneye, the bufflehead or the red-necked grebe. There are a lot beautiful flowers and vegetation on display so there are plenty of opportunities to get some colourful shots. As you stroll further down the trail you will see the lake itself in the distance. You can choose to do a little bit of the trail and head back where an option is to walk down the trail to Oster Lake which starts on a wide level trail. This is a part of the Shirley Lake Trail. You may just be lucky to spot bison on the way. They can also block the road so you can’t get any further. If you spot bison be careful you don’t get too close as they can charge. From here you can also choose to walk back onto the Simmons Trail and head on to the Shirley Lake Trail from the other side. This is possible as this trail, like the Simmons Trail, is a loop. It is a 12.5 km (7.8 miles) loop trail which will take you about 3-4 hours to meander through. 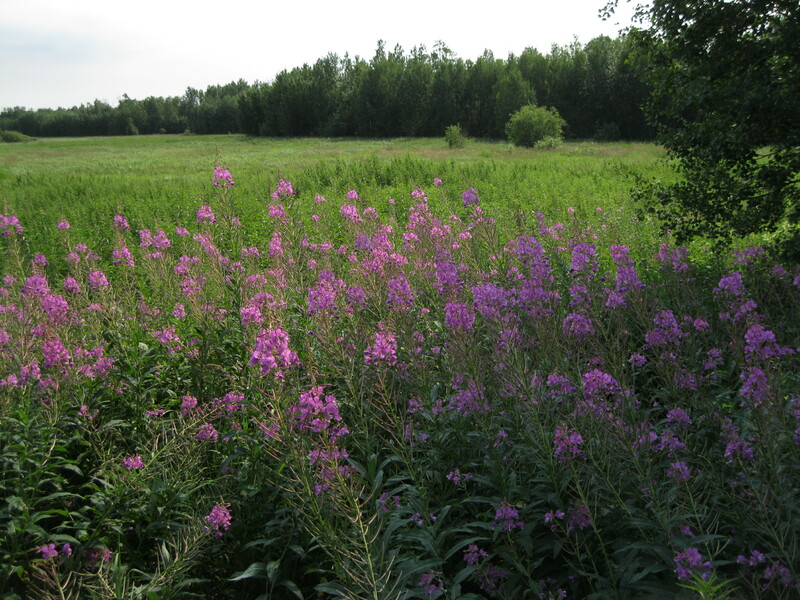 The trail is pretty easy as well and there will be amazing views of aspen forest, grasslands, lakes, ponds and meadows. If you are lucky you may be able to spot wildlife such as bison, moose or elk. You can also choose to just do a part of the trail and then head back on the Simmons Trail and then back to the carpark if your vehicle is parked there.